With Mother’s Day approaching, I know many of you out there are on the quest for the ideal piece of jewelry for your mom. Well what about upgrading her jewelry box instead? I’m sure that she’s due for an upgrade, don’t you? 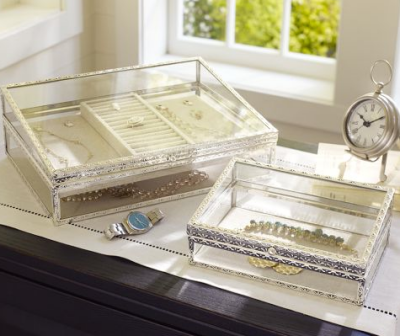 I like the clean lines of the Andover jewelry box by Pottery Barn. I love the glass on top, so you can really see your most-used pieces. You can get it monogrammed too! I also just adore these two boxes, also by Pottery Barn. I happen to own the smaller one, and it’s where I store my watches and daily rings/bracelets. A friend of mine owns the larger one, and she likes how it showcases her favorite pieces — really making her jewelry part of her boudoir decor. Now if your mom has a bangle collection that keeps on growing, then she might just need this acrylic stand from the Container Store. They make one for necklaces as well. Here’s a very sweet cloche from Anthropologie. I can see it used anywhere from the bathroom counter to a bedside table. Now if you really want to go all-out, and your mom has a vast collection, then this would be the epitome of a jewelry armoire! Of course, you can always give your mom a jewelry box with a new piece of jewelry in it as well…just a thought. Enjoy!